We're really excited about today's launch of Nexus One. The device is the newest phone to run on the Android platform with Google Maps for mobile pre-installed, and the app has never run better. Nexus One has a super fast 1GHz processor and feels as fast and responsive as any phone. But my favorite thing about Nexus One is the beautiful, 3.7" high-resolution AMOLED display. I use Google Maps Navigation (beta) constantly for turn-by-turn guidance and traffic, and having such a large, clear display makes a world of difference. Maps are more readable, and satellite and street-level imagery look amazing. And when I pull up to my destination and a large, crisp Street View is shown automatically, I know exactly what to look for. 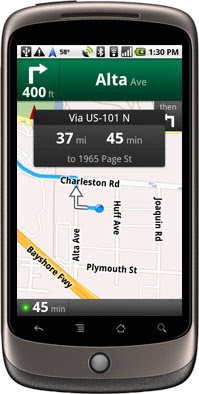 Nexus One ships with Android 2.1, including the latest version of Google Maps and Navigation. It also has all the other new features we've launched in the past year, such as Google Latitude, layers, and labs. To learn more about Nexus One, visit google.com/phone.